Would you like a chance to win cash prize? Enter the Weather Channel Photo Contest now for your chance to win Fifteen Thousand Dollars ($15,000) which will be awarded in the form of a check made payable to the winner. How To Enter: During the It’s Amazing Out There 2018 Photo Contest period go to this link and follow the online instructions and upload one (1) photo that relates to weather, nature, and/or adventure adding a caption/photo description of no more than 200 characters in length and enter all information requested on the registration form. Prizes: One grand prize winner will win the Fifteen Thousand Dollars ($15,000.00) which will be awarded in the form of a check made payable to the winner. One (1) Second Prize: The Second Prize will consist of Five Thousand Dollars ($5,000) which will be awarded in the form of a check made payable to the winner; One (1) Third Prize: The Third Prize will consist of Two Thousand Five Hundred Dollars ($2,500) which will be awarded in the form of a check made payable to the winner. Who Can Enter: The contest is open only to legal residents of the fifty (50) United States and District of Columbia who are eighteen (18) years of age or older at the time they enter the sweepstakes. 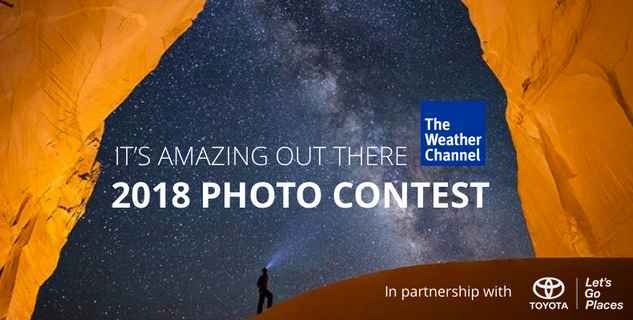 When To Enter: The Weather Channel Photo Contest entry begins on July 10, 2018 at 12:00 PM Eastern Time (“ET”) and ends on August 14, 2018 at 11:59 AM ET. Who’s Sponsor: The Weather Company, an IBM business, 1001 Summit Boulevard, Floor 20, Brookhaven, GA, USA 30319.